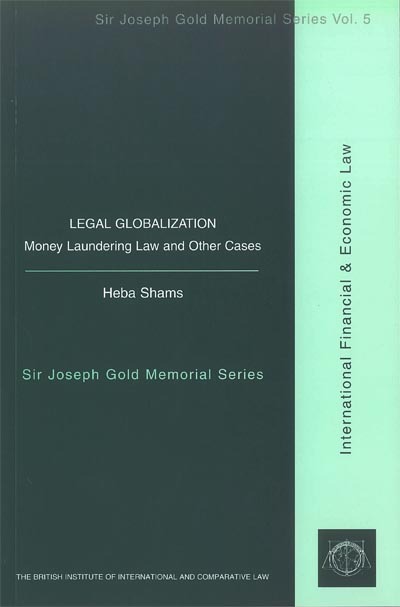 Volume 5 in the Sir Joseph Gold Memorial Series deals with the case study of money laundering law. Over the past three decades, globalization has been gathering momentum. As a process of social change, globalization has been propelled by rapid technological innovation which rendered massive instantaneous communication possible, as well as extensive processes of de-regulation and liberalization. The combined effect of these developments was the emergence of non-State actors which operate across national borders and master substantial economic and informational power. Meanwhile the State, as the primary agency of governance, has remained jurisdictionally territorial while becoming less dominantly powerful. Both features have resulted in a ?governance crisis? and have turned globalization into a ?legal problematic?. In response, legal governance adopted six different modalities, each of which presents a certain deviation from traditional legal principles. Resolving the tension between change and continuity is a two-way process which involves revising both the legal response to globalization and the traditional principles that it challenges. The case study of money laundering law demonstrates emphatically the legal problematic, the modalities of the solution and the challenges they pose. Other cases drawn from UN law, environmental law, securities regulation and internet law will also show that money laundering law is not an isolated incident. "Legal Globalisation: Money Laundering Law and Other Cases"